The Record Breaking Fishing Trip. And the Joy of a Bath. I was still quite far away. But could see two dark brown spots with white crowns against the early morning bright blue sky. 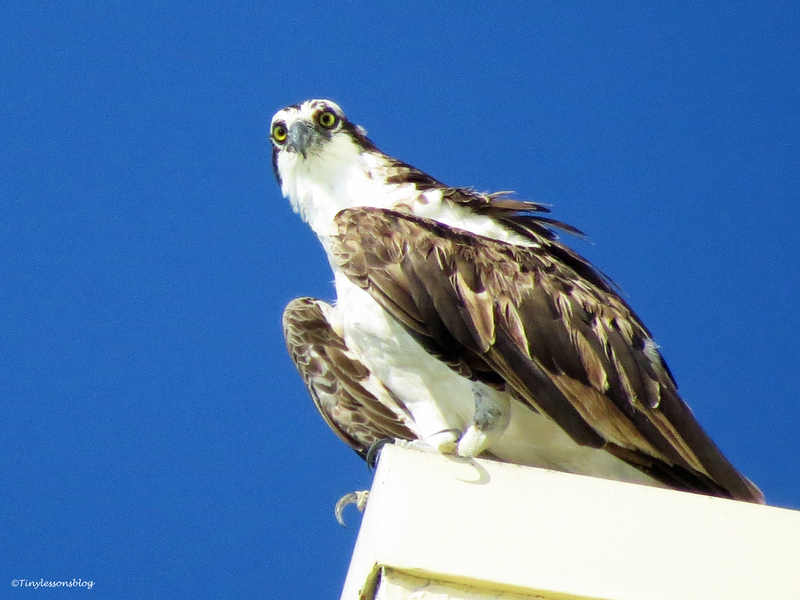 My two favorite Ospreys. I hadn’t spotted Mama Sandy or Papa Stanley for quite a few days, and was getting worried about the nasty wound Sandy had on her leg last week. 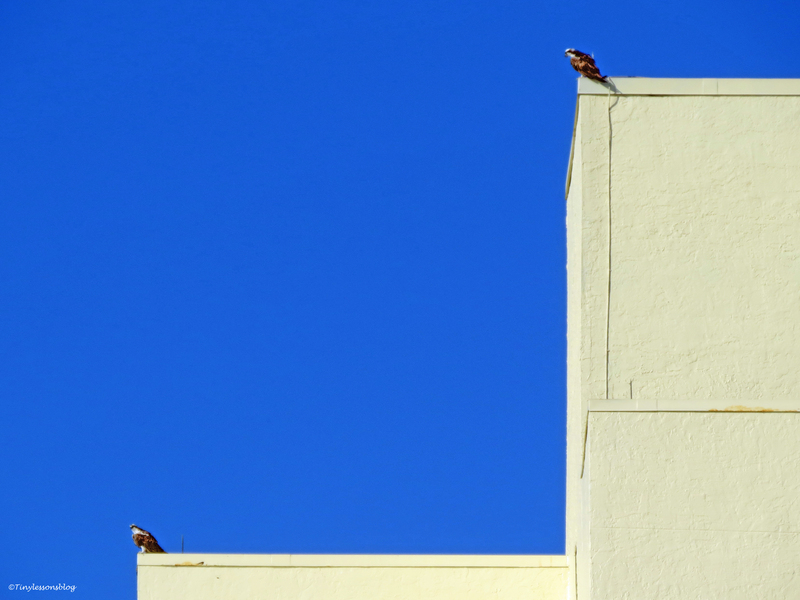 But there they were, peering down into the bay waters from the roof of Marriott Resort. I was walking closer. Suddenly I saw the one on the lower roof fall straight down. Immediately followed by a loud call from the roof top. It looked like a free fall, wings pointing straight up. I stopped in my tracks, but couldn’t see the surface of the water from where I was. I scanned the sky over the bay. 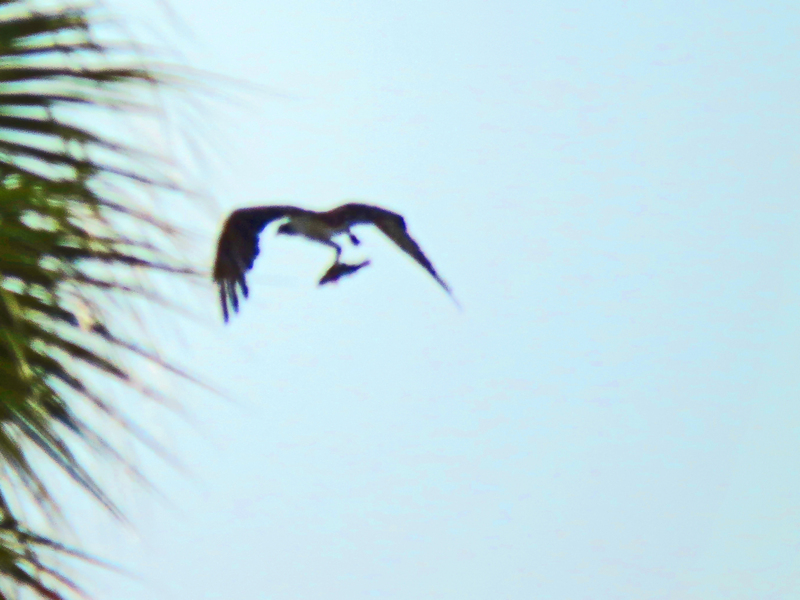 And there it was, against the rising sun, a silhouette of an Osprey flying back on shore with a fish. I took a blind shot. Just as evidence of the fastest catch I’ve witnessed. Ten, maybe fifteen seconds tops. Now I had to find out who it was. And where the breakfast would be served. Although I was on my way back home after a two and a half mile walk, I turned around and retraced my steps back towards the Sailing Center. Then I saw it. An Osprey eating breakfast on a lamp-post quite far away. With a helpful cleaning crew close by. I was too tired to walk all the way to the lamp-post to be on the “right” side of the sun light. So I just zoomed all out. And saw it was Sandy. Her wound was still faintly visible, but healing well. What a relief! Happy after seeing her lightning fast dive, I walked back towards the resort. And found Stanley peering down too. At me. He seemed to enjoy his spot on the top of the world. Instead of taking care of sick Sandy in some secret location, like I had feared. I smiled at the thought, and hoped to catch his breakfast dive. But it soon became clear to me that he was not in a hurry. 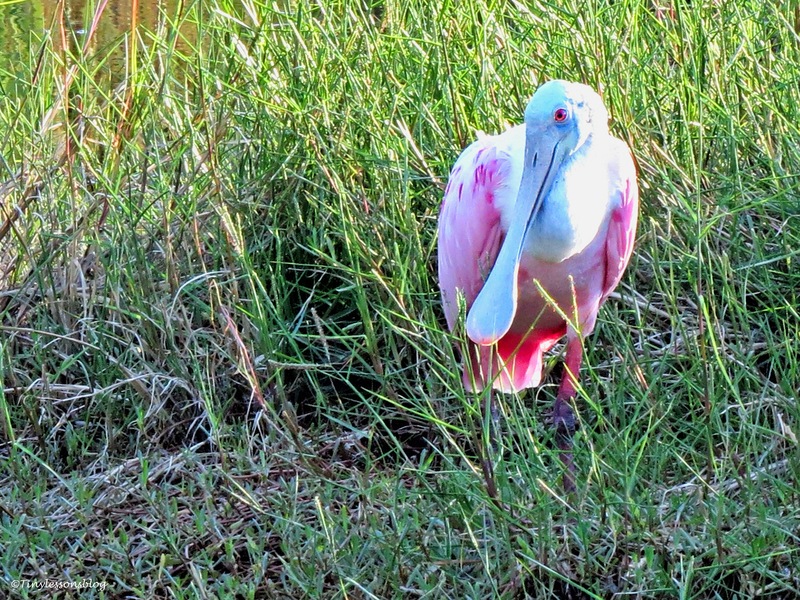 He was more interested in watching me at the parking lot below than scanning for fish in the bay. So I decided to remove the distraction and walk home. Stanley could get his breakfast. And I could get my second cup of coffee. Around mid-week I took another walk later in the day, and started at the salt marsh. 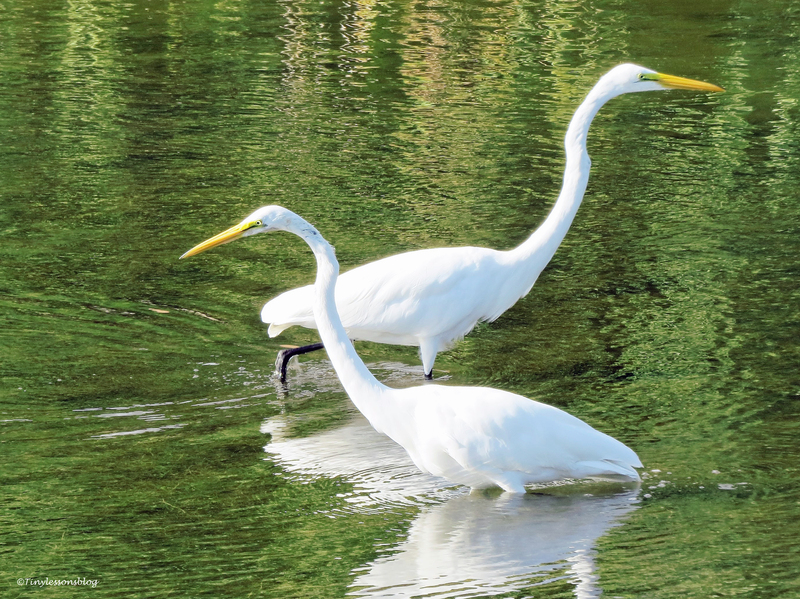 Lots of Great Egrets were enjoying the quiet afternoon. 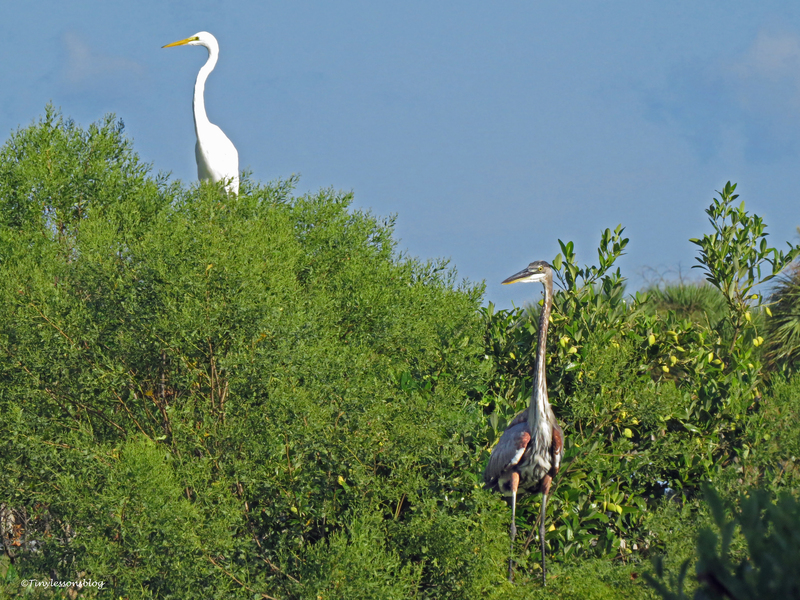 And I also spotted both the Mayor and the younger Great Blue Heron. Rosa was at home too. She always volunteers a nice pose, doesn’t she? A Black-crowned Night Heron was in deep meditation. Or maybe just thinking of breakfast. From there I walked to the beach. 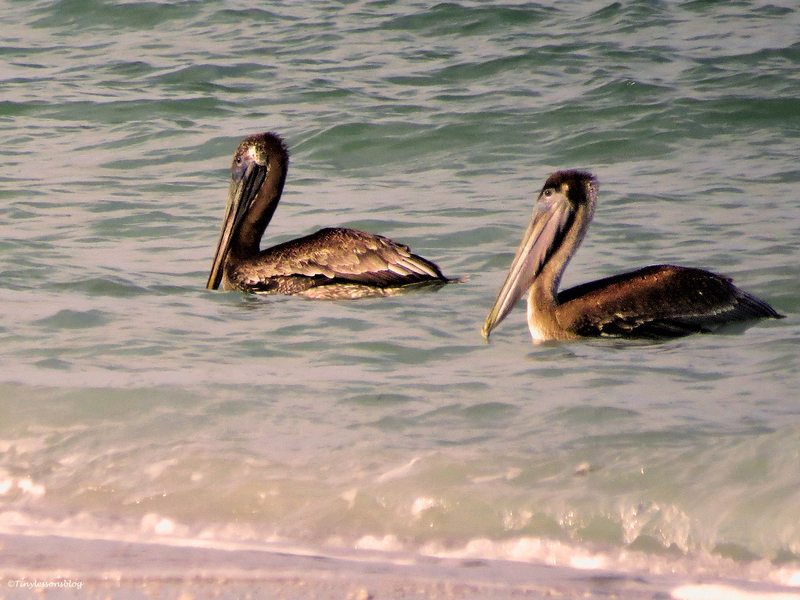 And had the pleasure of the company of an American Oystercather and a few Brown Pelicans. I noticed the high tide had made a temporary swimming pool by building an extra sand bank between the beach and the ocean. I watched a Royal Tern thoroughly enjoy her bath. I prepared a gif image to let her show you how it’s done (if the gif doesn’t play, please click on the image). 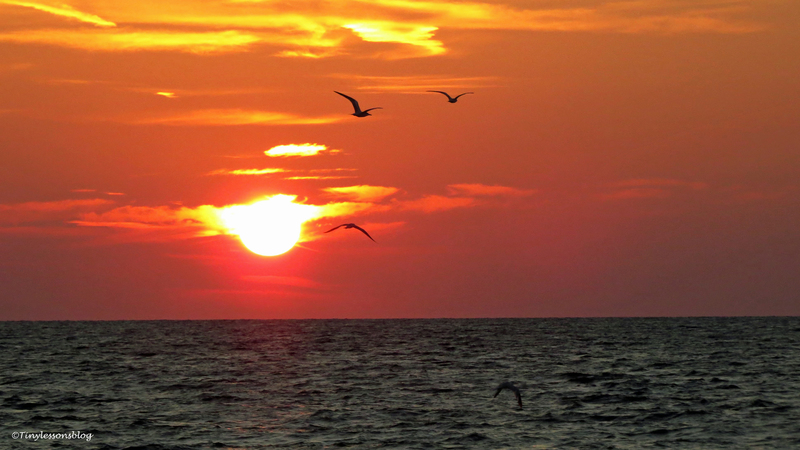 Little later, the sun started her dive into the ocean, offering brilliant colors on the evening sky. I wish everyone a great weekend, and hope T.S. Erica doesn’t invite herself to visit the salt marsh early next week. We don’t want to meet her. Very cool pictures, and I like that animated gif! An awesome day from beginning to end. That little bath gif is just the best! Sending positive thoughts your way to help keep Erica away…stay safe! That little tern was so enthusiastic about the new pool that I thought her bath should be “animated”. Happy you liked it. I think Erica will not be a strong storm wherever she goes, but a rainmaker…and we don’t need more rain here after the flooding a few weeks ago, so we hope she stays away. Thanks Susan. All great captures, these birds are so beautiful! Good to see Sandy and Stanley. 🙂 Stay safe, Tiny! Thanks Amy! It was good to see them…I get worried when I don’t spot them for a few days 🙂 We’ll be fine, just don’t need another round of flooding! Flooding is horrible to deal with. I wish I had been closer to capture Sandy’s dive, but maybe next time 🙂 We have pelicans here year round, but more of them in the fall, I’ve observed. Miss Rosa is such a cutie…maybe she’ll get a husband next year and we can see small “rosettes” 🙂 I hope Erica will not be a real storm when she comes close to FL…just a rainmaker. Thanks Sylvia! Your photos are stellar as usual. Thanks for reporting on Sandy’s catch of the day. Oh, I wish I’d been closer…her dive was spectacular! Thanks Nancy. Ten seconds to catch a fish? Wow, what experts ospreys must be. 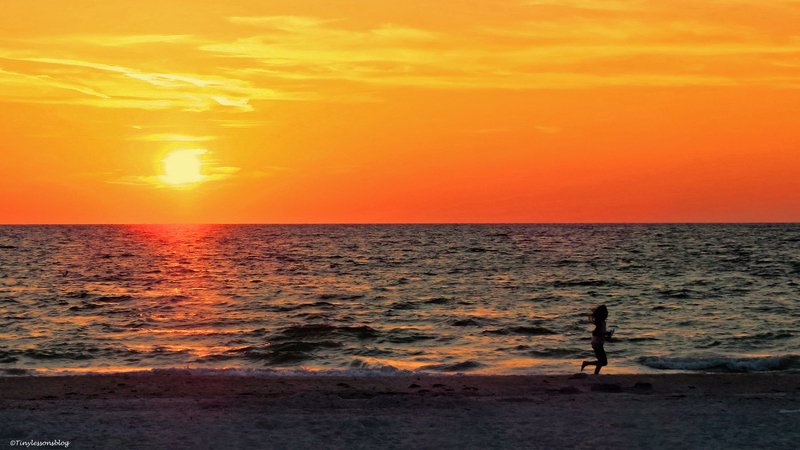 Love the sunsets, by the way. 10-15 seconds. 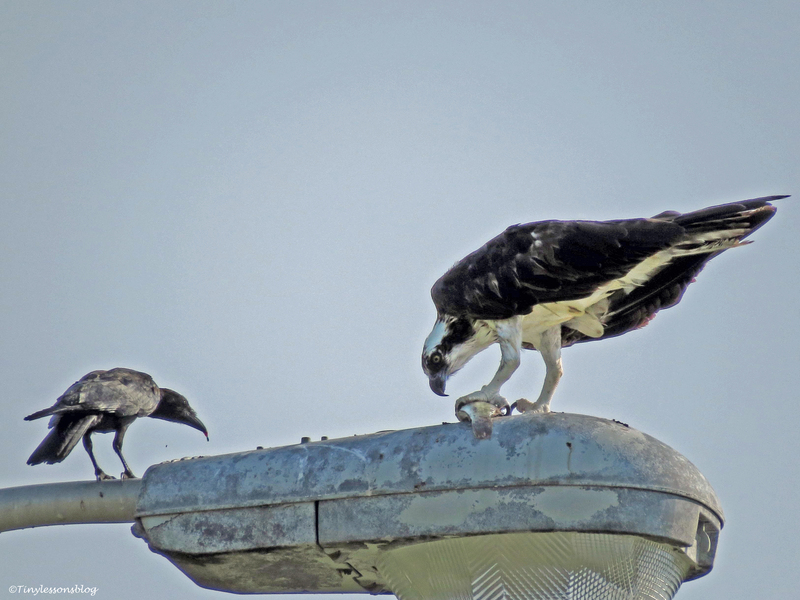 Ospreys are the best fishermen among birds. The very best have about 70% success rate – and Sandy is in that master class. I’ve seen her do 30 seconds at the salt marsh when the kids were hungry and Stanley had stopped to have coffee on his way home from the grocery store. Interesting writing, lovely pictures, a great pleasure to read. I’m glad you liked their story Susan. Have a great weekend. I am glad Sandy is healing up and throwing down when it comes to fishing! Just look at you. Advancing to GIFs. Will wonders ever cease? Smiling. Thankfully no. But that has nothing to do with me. And I promise not to get going on these. 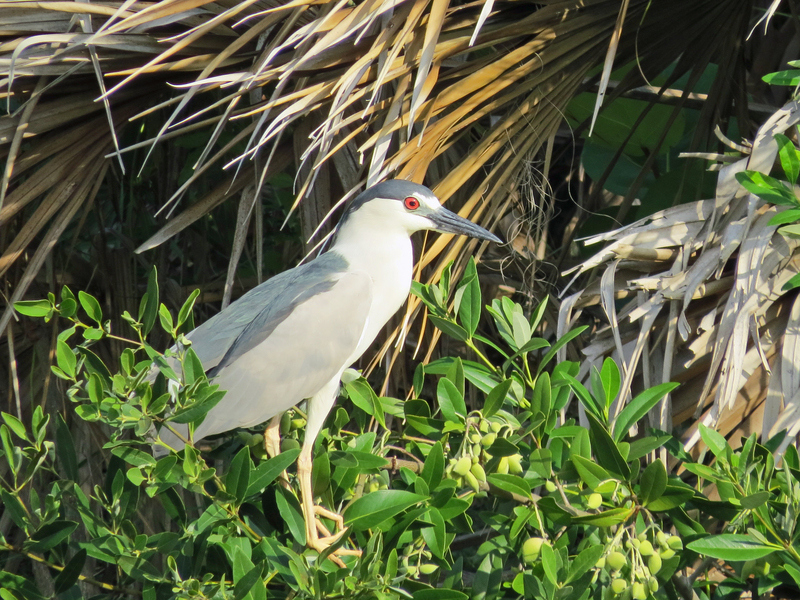 In a feast of enjoyable photographs, the night heron hit me hardest. What sharpness. Thank you! 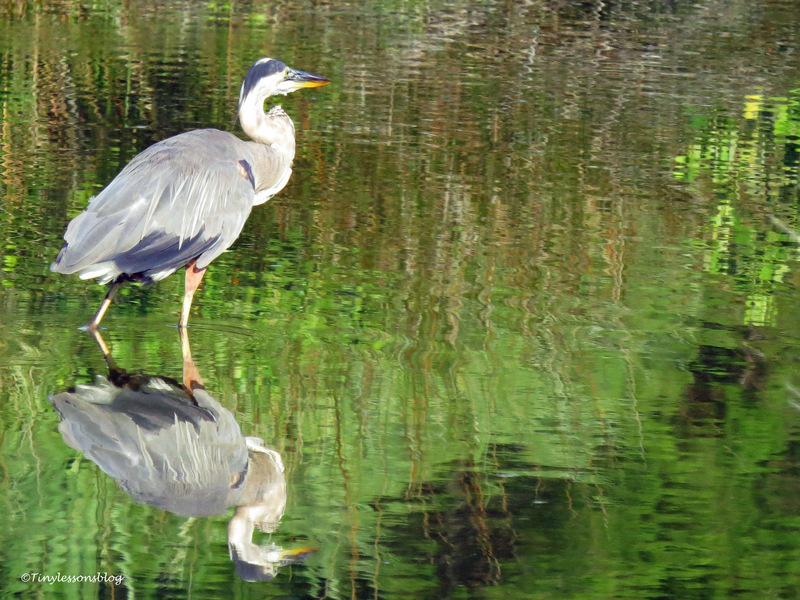 The night herons are good photo models as they usually sit quietly, concentrated on something internal or external. Lovely community you have there. Between your ability with the camera and their poses, it always looks magic. Glad Mama Sandy is fine. Hope your weather remains fine, too. 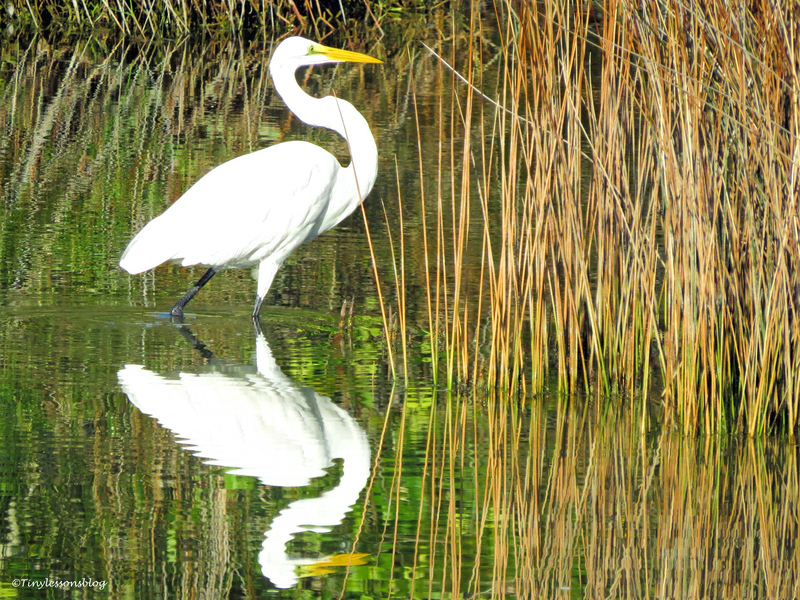 Love the reflections of the birds in the salt marsh. Yes, Sandy seems to be fine. They are both molting right now and that is always a stressful time for them. Our weather will be very rainy for 2-3 days due to the remnants of the tropical storm that fell apart. It’s supposed to start tonight. What a great day! You have some lovely captures of the bird familia 🙂 So good to see everyone getting into their routines again! Thanks Kathy, happy you liked them. I did Helen – I love your blog and your photos! A most delightful post with some vividly colourful birds, Tiny. 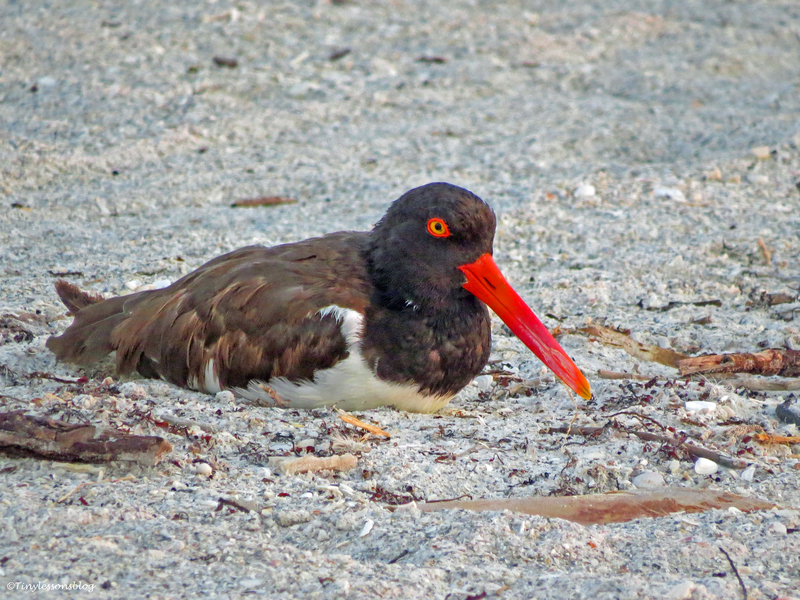 I love the colours of Rosa and the Oystercatcher. I love your sunsets also. It is wonderful that you are so well acquainted with Sandy and the Osprey family, and that you know them so well. Thanks again I always enjoy what you present. Wow you got some great shots. I love herons. I enjoyed your post very much! The narrative, the photos, the personalities all made for a wonderful read. I couldn’t open the GIF on my tablet, so I’ll have to try again with the desktop. Cheers, and Happy Birding!